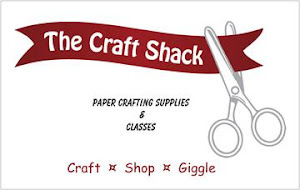 This is the 2nd month of The Craft Shack's ATC Club & it was my turn to design the February ATC. The club will run for 12 months so at the end everyone will be able to display them in a 7 Gypsies Artist Printers Tray. I like to take a technique you'd normally do with a card & reduce it to ATC size so I decided on a shaker ATC. As you can see in the photo above, the basic card is simple...SU Cherry Cobbler cut 3 1/2 X 2 1/2 for the base. The next layer is white card stock cut to 3 3/8 X 2 3/8 then stamped with Hero Arts Old French Writing Stamp in Tim Holtz Fired Brick Ink & the edges are distressed with ink. Cupid was cut from Tim Holtz Gold Deco Sheet using Tim Holtz Mini Love Struck Movers & Shapers Set in the Movers & Shapers Magnetic Tray. 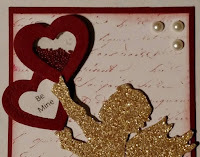 By the time the heart shaker was put on Cupid was going to be to wide so I (literally) clipped his wings & tucked them behind his back just enough so he'd fit on the card. To make the shaker heart, I punched a small heart using the EK Heart Punch then positioned the next to the smallest die from the LittleB Heart Die Set around the negative of the punched heart. From the same die I to cut the back of the shaker from white card stock & a piece of acetate. The 2nd heart is done by placing the smallest die, which only embosses, inside the open die to cut a solid piece. 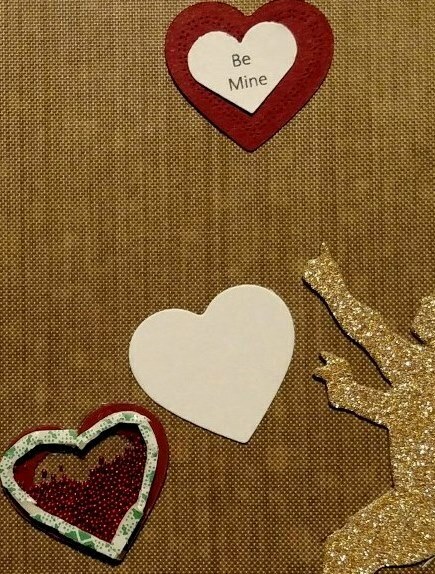 "Be Mine" was printed on white card stock punched out. To finish the shaker, the acetate heart was wiped with a dryer sheet to remove any static then adhered to the back of the open heart using Glossy Accents. Be very careful not to use too much or it will squish out & smear on the acetate. Then I cut 3 slivers of foam mounting tape, starting at the top on one side, placed it slightly in from the edge on the acetate, shaping it around the heart. I then did the other side, starting at the top & finished with the piece at the bottom (shaped into a V). Make sure there aren't any gaps s0 the beads don't spill out. Using a spoon I placed a small amount of Red Pop Micro Beads in the cavity...you don't want to over fill or it won't shake. 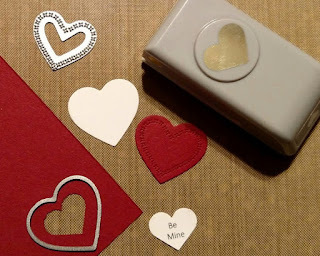 Next remove the strip from the foam tape & add the white heart, making sure it's lined up. 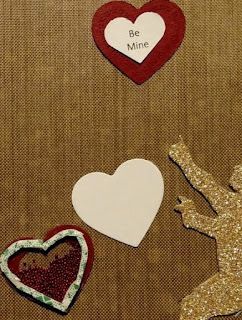 "Be Mine" was adhered to the solid heart so the embossing shows. 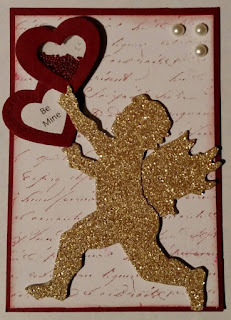 Cupid & the hearts are adhered to the base using Tombow Mono Adhesive. 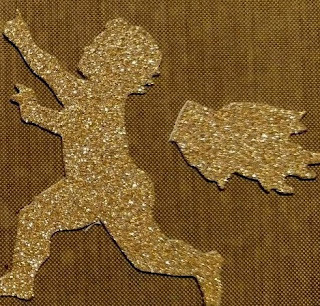 To give Cupid's just a little dimension, his arm is popped up to hold the shaker heart & "Be Mine" is tucked behind the shaker. The 3 white pearls were the finishing touch. Hope you enjoyed my card and try making one.